A B2B White Paper is a document used by sales and marketing teams to generate interest in a specific trend, topic, or technology. So, how do you write a white paper? Before you start writing, you need to know what it is, right? I know that sounds obvious but one of the difficulties with white papers is that they mean different things to different people. One way to make things simple is to create an FAQ and answer the most common questions people have about writing these documents. In many cases, it summarizes information about a topic, for example the results of a survey and then suggests a proposal for action; the research data provides the justification for the action. How to define a White Paper? Definition: A white paper is a high-level marketing document targeted at decision makers. Share technical knowledge and business information with others in the same field, for example, CIOs interested in knowing how web services can be used with Ecommerce applications. Used as marketing collateral for presentations at industry conferences, promotional drives, seminars and other such events. From a business viewpoint, a white paper helps generate publicity, especially when a company is starting out and trying to get media attention. 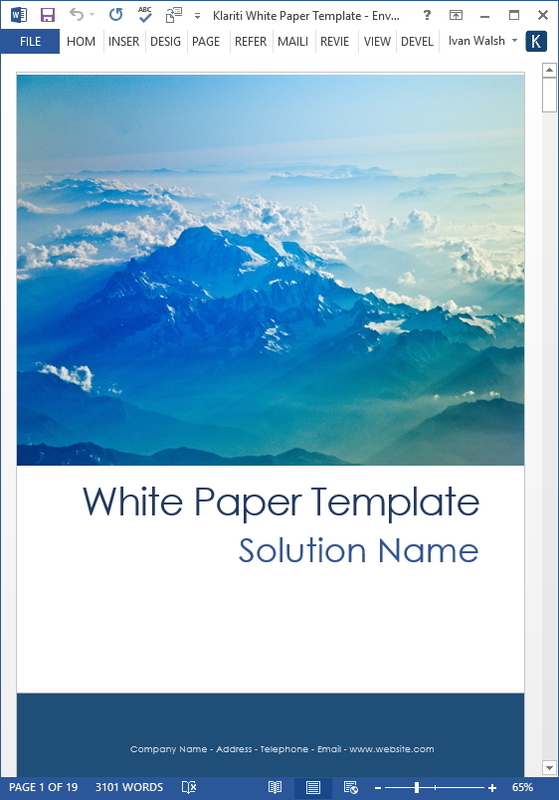 If a company is working on an innovative area or solutions for a specialized audience, these white papers can be very effective in demonstrating the company’s achievements. The difference between an IT white paper and, for example, an academic research paper is that the software company’s document tends to be more guarded. So competitors don’t learn too much and steal their ideas. Of course, it’s not always that way but this may apply when discussing an emerging technology. This can change when companies ‘pitch’ white papers at less technical consumers, journalists, and others outside the executive layer. The best written white papers avoid jargon, clichés and ‘marketese’- that disingenuous type of marketing writing that makes outrageous statements and over-the-top claims. Sales teams rely on white papers, in particular when introducing new products. It provides valuable collateral material when meeting clients and prospective customers. It is something they can leave with the client who can examine it in their own time… and then follow-up later. Technical abstracts from market research companies that support the proposed solution. This highlights successful implementations of the product/solution supported by endorsement and quotes from the client. This includes tables, charts, and graphs regarding the solution. All the technical specifications are distilled down to a few pages in an easy-to-read format. This describes the Unique Selling Points (USPs) supported with persuasive arguments that differentiate it from the competition. Are there industry standards for white papers? No, in the sense that there are no formal guidelines or industry bodies, such as ISO. Yes, in that there is an ‘expectation’ from readers that the document will follow a specific, well-recognized format. Most white papers use the same structure, which gives them a common feel. However, there are no format guidelines on how you must write a white paper. When I started writing white paper in the 1990s, they were at least ten pages long. Then, for various reasons, they began to shorten. Today, most white papers are between 5 to 8 pages long. Saying that, clients often have an expectation (i.e. if you write white papers for a living), for a longer document or at least higher word count. Again, this is a personal matter as word count and page length don’t always translate into better returns. However, some clients will demand a minimum word count. White papers that are published on the Internet tend to be converted into Adobe PDF. This helps retain the style and format; it also protects the authors as they can stop others cutting and pasting their text. For trade shows, events, industry events and other marketing activities, white papers are printed out, usually on high quality paper. This stops the ink running and leaving smudges on one’s hands. Provide facts and statistics. Support these with references. When is a NOT a White Paper? If there are no formal guidelines, how can you tell if something is really a white paper? Here are two ways of looking at it. Case studies and white papers sometimes seem to overlap. This can happen if the author changes the context of the solution or if the white paper discusses an implemented project in too much detail. White papers can be slightly abstract, whereas case studies are based on events in the real world. Another way of looking at it is pre sales v post sales. …these documents are post sales. While all of these documents are helpful in their own way, most are post sales. In other words, something you use AFTER you’ve bought your product. A white paper is a pre-sales document. If someone tells you its part of their technical documentation suite or customer support, they’re misleading you. It’s a pre-sales document for the sales and marketing team.